White Cloud Cirrus II has been awarded FOUR AND ONE HALF STARS. It is HIGHLY RECOMMENDED. After having read a number of reviews referring to White Cloud as “the Rolls Royce of E-cigarettes,” we decided to head over to their site and pick one up for a review. The brand had developed a reputation for being both finely engineered and expensive. We were intrigued by the idea of smoking the “best e-cigarette” money can buy. While there was no way to make a final determination of White Cloud’s quality by visiting their website, suffice it to say that they got the pricing part of the Rolls Royce comparison right. (Editor’s Note: This review was originally written prior to price drop.) Not wanting to spend more than what was required for review testing; we selected the Cirrus II Starter Kit priced at $49.95 (now reasonably priced at $39.95 before coupon code). While the price of the Cirrus II was originally higher ($49.95), the new lower pricing ($39.95) combined with the 15% off discount code provided below brings the total cost of the kit to only $33.96 before shipping charges ($4.99). This is an excellent value as White Cloud is likely the highest quality brands we have ever tested. It is designed and constructed like no other electronic cigarette before it or since. Further, if you are or were a moderate-to-heavy smoker, we could not recommend a better e-cigarette to satisfy your Nicotine requirements. No other e-cig reviewed here provides the option for as much Nicotine kick as the White Cloud (see Nicotine Strengths table below). We were pleased to see that the White Cloud website had a page dedicated to their SmoothDraw Cartridge ingredients, as well as a section that dispelled some all-too-common e-cigarette myths, including the one about anti-freeze. Another useful page was dedicated to facts and misconceptions regarding Nicotine. The site also featured an informative (and somewhat comical) product safety testing video that was created in response to the popular news story about the e-cigarette that “exploded” in a Florida man’s face. Three days after ordering, our White Cloud Cirrus II Starter Kit arrived. Opening the box and removing the user Manual revealed the batteries, cartomizers, and USB charger, as well as a 15% off coupon for online orders (note that White Cloud is also available at 23 retail outlets located in Florida, Illinois, Indiana, Michigan, Ohio, and Pennsylvania). We immediately assembled our Cirrus II and took a long slow drag. Drawing on the SmoothDraw cartridge was easy and quiet. There were no traces of the crackling or popping sounds we associate with lesser-quality brands. A wonderful throat hit was complimented by a pleasing tobacco and fruit-like flavor with mild strawberry undertones. We exhaled a good-sized cloud of perfect white vapor. Pleased with our first drag, we inhaled again with similar results. So far, so good. There were two distinct characteristics of our first White Cloud smoking experience. The first was the extremely satisfying volume of Nicotine. 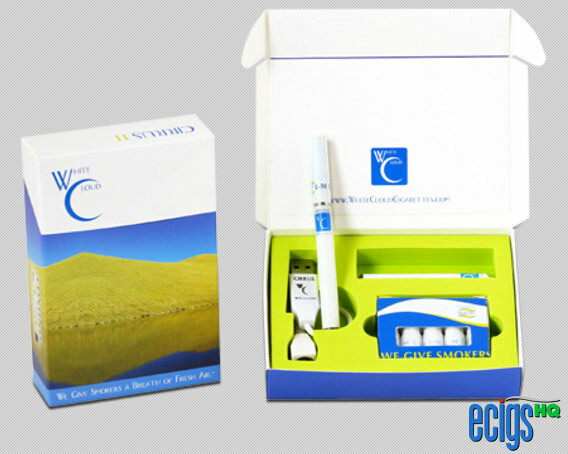 White Cloud offers 6 levels of Nicotine with its Regular Tobacco cartomizers (Nicotine-free, 0%; Ultra-Light,0.8%; Light Strength, 1.6%; Full-Strength, 2.4%; Extra Strength, 3.6%; and Double Extra Strength, 5.4%(!)). We had ordered the Regular Tobacco, Double Extra Strength and it was without a doubt, the most satisfying hit of Nicotine we have ever gotten from an e-cigarette. The second distinct quality was the remarkable throat hit. In that department we have yet to smoke an electronic cigarette that is the equal of White Cloud. Please note however, if you are a social or light smoker, the Double Extra Strength cartridges are probably not for you. They are intended for former moderate-to-heavy smokers, who require a substantial amount of Nicotine to satisfy their cravings and prevent symptoms of Nicotine withdrawal. Pleased with our first White Cloud Cirrus experience we set one of the two included batteries to charge overnight. The following day, we resumed our testing with the now fully-charged battery. We were pleased to experience a repeat performance highlighted by good vapor volume, noteworthy throat hits and enough Nicotine to satisfy the most die-hard smoker. Including the cost of the $39.95 Cirrus II Starter Kit, the cost to maintain the equivalent of a one-pack-per-day cigarette habit would be only $2.93 per day, or $20.50 per week, or $89.12 per month, or $1069.45 per year. In terms of long-term costs, White Cloud provides excellent value — especially when compared to the cost of tobacco cigarettes which will set you back $2,555 per year for a one $7.00 pack per day habit. Use the White Cloud Starter Kit Coupon Code below to save even more. Double Extra Strength SmoothDraw Cartridges contain 5.4% Nicotine by volume — the highest in the industry! White Cloud has earned FOUR and ONE HALF STARS and is HIGHLY RECOMMENDED for moderate to heavy smokers who require a great throat hit and ample Nicotine. While social and light smokers can avail themselves of other brands, White Cloud is a must-try for those who’ve found e-cigarettes to be less than satisfying when compared to their tobacco counterparts. 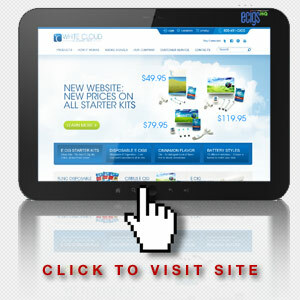 Click on the White Cloud website link below. Enter WCKIT15 in the Coupon Code box at the checkout to receive a 15% discount on your starter kit purchase.